The Bill & Melinda Gates Foundation is shattering donation records at the UW with a $279 million grant to continue and expand programs that measure health around the globe. The Bill & Melinda Gates Foundation is once again shattering donation records at the University of Washington, this time with a $279 million grant to continue and expand pioneering programs that measure health around the globe. The money will fund another decade of work at the UW’s Institute for Health Metrics and Evaluation (IHME), which was founded 10 years ago with a $105 million Gates grant that was at the time the largest gift in UW history. That record was eclipsed three months ago by $210 million from the foundation for a new building to house IHME and the Department of Global Health — which was also funded by Gates. “This is an amazing vote of confidence in the work taking place here,” UW President Ana Mari Cauce said of the newest grant, which ranks among the largest single donations to any U.S. university. It brings to $1.25 billion the total amount given to the UW by the Gates family and foundation over the past two decades. And that doesn’t include more than $100 million in gifts to the UW from Microsoft, the company co-founded by Bill Gates. 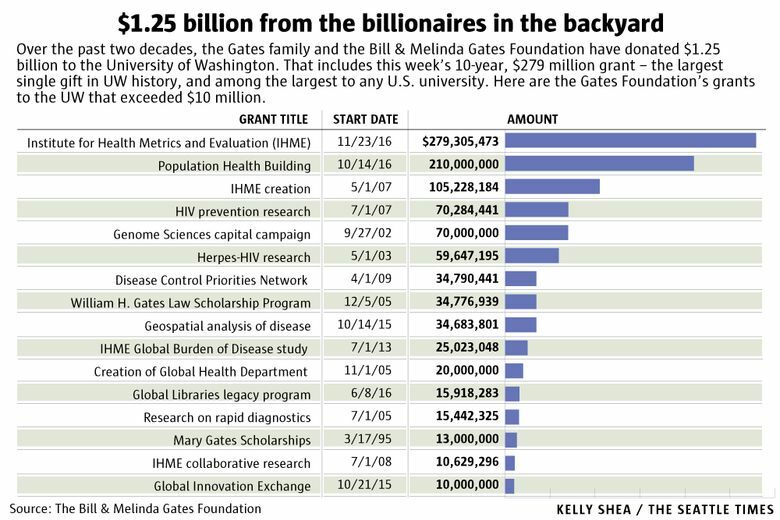 Gates money has funded everything from AIDS, autism and tuberculosis research to scholarship programs and the UW marching band. The long association between the UW and the world’s richest man and his family started as a matter of proximity but has developed into something deeper, Melinda Gates said in an email. Bill Gates’ father, mother and sister all attended the UW and went on to serve on its board of regents. IHME is by far the Gateses’ biggest-ticket investment at UW, with $445 million in funding since its inception. Using a big-data approach, the institute produces the most comprehensive analyses of the causes of death and disability around the world — from cities and villages in Africa and India to Washington state. “It is the gold standard,” Melinda Gates wrote. The institute grew out of the Gateses’ frustration with incomplete and conflicting information about the toll of diseases like malaria, even as their foundation was trying to prioritize programs and evaluate the health impact. Bill Gates was impressed with the work of medical statistician Dr. Christopher Murray, who had developed a method to estimate not just the number of people killed by various diseases but also the impact on health and productivity. When Murray’s plans for a health-statistics institute at Harvard fell through, the Gateses lured him to Seattle. IHME started with three people, and has grown to more than 300. The new funding will expand the staff to about 500. 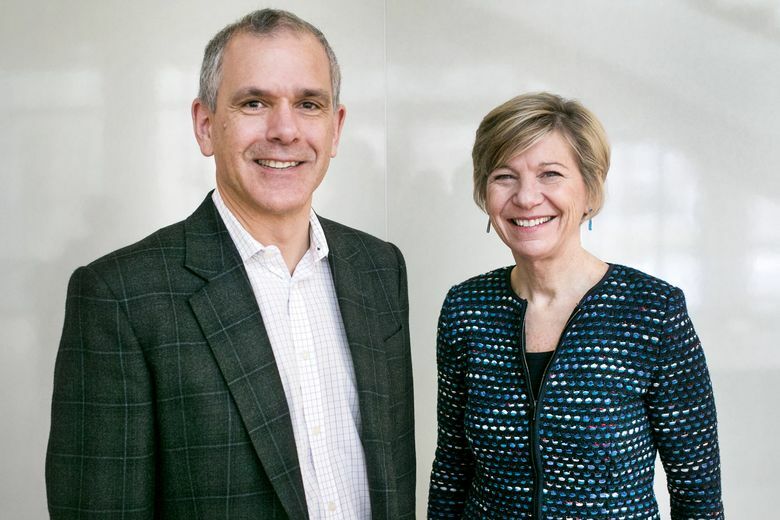 For the Gates Foundation, IHME’s health assessments are the “north star” that guides their actions, said foundation CEO Dr. Sue Desmond-Hellmann. “To have a trusted source, a group that has the kind of intellect, firepower and talent that Chris has assembled, is really an important asset for us,” she said. An early finding from IHME that the health impacts of malaria had been underestimated helped guide the foundation’s decision to make the mosquito-borne disease one of its top priorities. Now, the foundation is relying on localized analyses by IHME to help fine-tune regional strategies for wiping out malaria, Desmond-Hellmann said. The foundation is also using IHME data to monitor the shift from infectious disease to more chronic problems like heart disease and high blood pressure as countries become more affluent, she said. Initially, though, IHME antagonized other health experts, who accused the Seattle institute of arrogance and failing to share data and methods. Its first global health report card was not acknowledged by the World Health Organization. Since then, the institute has put all of its raw data and code in the public domain, and expanded its network of collaborators to include almost 2,100 people in 130 countries. The Gates Foundation created an independent advisory committee to hold the institute accountable and help strengthen its relationships with other key players in global health. Some experts remain critical of the disease survey as well as the Gates Foundation’s outsized impact in global health. IHME’s estimates of diarrheal disease, a major killer of young children, have varied tremendously and the institute still hasn’t fully explained how it came up with the numbers, Sandy Cairncross of the London School of Hygiene & Tropical Medicine said in an email. “The Gates Foundation has acquired a reputation for throwing its weight about, but I think that’s mainly because there is so much of it that when it scratches an ear many of us think it’s an earthquake,” he wrote. Eventually, Cairncross said, he hopes the foundation will realize it needs to engage more with the public, including in the impoverished countries where it exerts so much influence. Though much of its work is on the global stage, IHME also focuses its analytic lens on the United States, with some eye-opening results, Cauce pointed out. For example, average life expectancies can vary by as much as 8 years within a few hundred miles of Seattle. “One of the biggest challenges we have in this country is how do we bring top-of-the- line health care to more impoverished communities?” Cauce asked. IHME’s expansion, and the new Gates-funded building on campus, are part of a long-term UW initiative on “population health.” The idea is to use big data and technology to help tease out factors — economic, social and environmental — that affect health, then find ways to improve them. In its current Belltown location, IHME is separated from the broader UW community, though many of its staffers serve as faculty and students participate in some of its programs, Cauce added. When the new building opens in 2020, the institute will be “right smack on the main campus,” and Cauce said she expects interactions with students and faculty will increase. In addition to ongoing health assessments, IHME plans to do more analyses of global health funding and spending, and more forecasting to help leaders figure out how their actions might impact their communities’ health in the future.